Hard times in Moldova are prompting some Moldovans to warm to the idea of unification with neighboring Romania. On July 5, thousands of Moldovans, carrying Romanian flags, marched in the Moldovan capital, Chișinău, voicing a preference that Moldova, a predominantly ethnic Romanian country that signed an integration agreement with the EU last year, give up on independence and join Romania, which is already a member of the EU and NATO. Moldova over the past year has been hard hit economically and politically — especially by a scandal over banking fraud that cost taxpayers billions of dollars and highlighted rampant corruption in the judicial system. Accused of doing nothing to respond to the crisis, Chiril Gaburici resigned as prime minister in June after prosecutors questioned him about the validity of his university degree. The government touts some economic improvements since the EU deal – a 64.6 percent increase in exports to the EU for the first six months of this year, lower foreign debt and a 4.8 percent jump in GDP. But the July 5 march participants, including 67-year-old Anastasia Fuior, are not impressed with the government statistics. The desire for union with Romania stems from Moldova’s own history. The Russian Empire wrested the territory now known as Moldova from Ottoman control in 1812, and made it part of its possessions as Bessarabia. Romania, on the western side of the Prut River, remained under Ottoman suzerainty. In 1918, after the collapse of the Russian Empire, Romania and Bessarabia united, but the union did not last long. The Soviet Union in 1940 occupied Bessarabia and additional territory to block Nazi-allied Romania. The Soviet republic of Moldova was born. 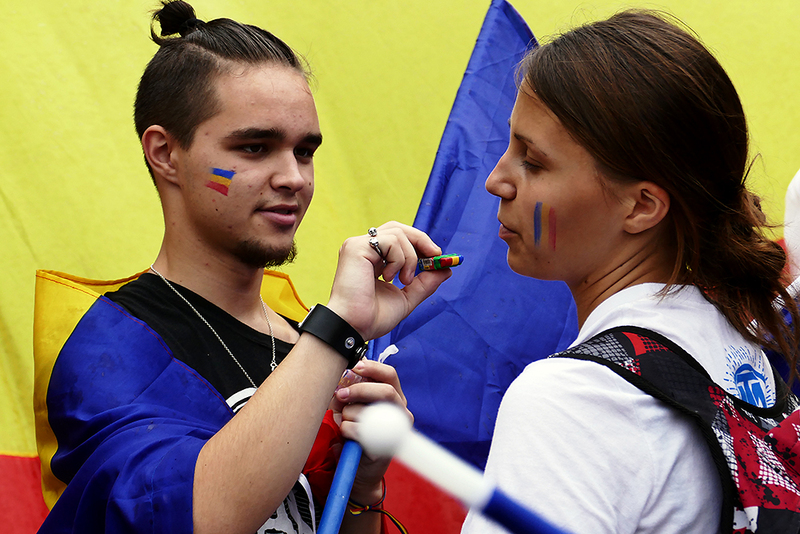 Initiatives to reunite with Romania have existed since 1991, but have never gained traction. Activists these days readily admit that unification will not happen soon, but say Moldova’s problems offer no other choice than to pursue it. Hundreds of activists are literally doing just that: walking by foot from Chișinău to the Romanian capital, Bucharest, a distance of roughly 488 kilometers, or about a six-and-a-half-hour drive. So far, neither Romania nor Moldova’s government has expressed a public position on the July 5 protesters’ appeal. Romanian media, however, provided heavy coverage of the July 5 gathering, which, officials estimated, a few thousand Romanians attended. “The Moldovan people will fight to strengthen Moldova's statehood,” Voronin wrote. “Moreover, your carelessness [in reference to European institutions] toward my country can have unpredictable consequences,” he predicted. That, in particular, could mean Russia. Russian politicians and officials recently have charged that Moldova blocks their dispatch of alleged peacekeeping troops to Transnistria, a breakaway Moldovan region dependent on Russian aid. Any indication that Moldova is tiptoeing toward merger with a NATO member state would heighten that alarm. Unionists, working within a National Unity Bloc of 22 non-governmental organizations, say they recognize that Transnistria poses an obstacle for their plans. Yet many of Moldova’s ethnic Russians, roughly six percent of the population of over 3.5 million, also are indignant about the yearning for Romania. Igor Dodon, leader of the country’s largest opposition party, the influential Moscow-friendly Socialist Party, has denounced the government’s silence toward what he described as “officials and representatives of right-wing extremist, nationalist and neo-Nazi” groups from Romania who attended the July 5 gathering. Moscow and its supporters similarly have claimed that neo-Nazi sympathizers are also active in neighboring Ukraine. Despite the criticism, activists remain upbeat. “Union will certainly take place, like in 1918, with flowers and hora [a traditional Romanian dance], where Romanians will dance on both sides of the Prut,” predicted Ursu.